The Brooklyn Sandwich Company is a glatt kosher food truck serving the students at George Washington University in Washington D.C. since July. This is just a part of a new wave of kosher food trucks and pop-up restaurants popping up everywhere. What is most unique with this one is that it is due to the work of one freshman student, Carly Meisel. Her goal is to serve kosher students as well as young professionals working in the city’s central district. But it took two rabbis, a bunch of students, some professional advice, a great cook, and a major donor to make it actually happen. Carly Meisel, 19, hails from Massachusetts. She came to George Washington University knowing full well that there was no kosher dining hall on campus. 140 colleges across the U.S. offer a kosher food plan; George Washington does not. However, she thought, that there would surely be kosher “options” for a committed Jew or Jewess. She was duly surprised. The university provides a single, infrequently stocked refrigerator in one of the dining halls with kosher wraps and salads. One look at their tiny size and the big price-tag ($13 to $15) and she knew it could not sustain her. And who knows how long those items had been refrigerated. “My first week of school here I saw my friends who had been keeping kosher their whole lives have their first bite of non kosher Chinese food, simply because they were hungry, and they felt like they didn’t have any other options,” Ms. Meisel recalled. She spent her year using a blender, mini crock pot and microwave to sustain her conviction to keep kosher. While this option made kosher food possible, it was challenging and not worth the time and effort. So she began to think that there must be a better way. She also heard that the local Sixth & I Synagogue has a kosher food truck cleverly called “Sixth & Rye.” But, it only pops up occasionally at community events. So, after sitting down last fall in the Jewish Colonials Chabad sukkah with Rabbi Yudi Steiner and some other students to discuss the “kosher problem,” she sought a solution. Her idea was to give it an upscale twist to the food while still keeping it affordable for students and others on a budget. While Jews make up 30% of George Washington University, only about 7% of the Jewish students eat only kosher meat (200 and 250 students), not enough for a kosher business to work, so Ms. Meisel sought a menu geared to satisfy a wider variety of customers, even those who are not exclusively kosher. For years Rabbi Yudi Steiner of Jewish Colonials Chabad had dreamed of a kosher food truck, ever since the school dropped their kosher food program. He helped Meisels to find David Spier, a generous alumnus donor, and the group set up a crowd-funding campaign that netted an additional $16,000 on top of the $50,000 in direct donations. Rabbi Steiner connected Brooklyn Sandwich to culinary and food truck experts. Dylan Kough, a DC food truck consultant, and Brooklyn artisan chef and culinary director Sam Akselrod (who made up the menu) were brought in to round out the Brooklyn Sandwich Company team. Rabbi Steiner also arranged the necessary licences. The food truck’s menu is far from extensive, but it reflects a level of culinary sophistication paired with an appreciation for quality ingredients. ,p>As would be expected by the name, there are 5 sandwich options (3 hot and 2 cold). The pastrami is served on a pretzel bun; the brisket is cooked sous-vide (in an airtight plastic bag) and pulled, and the cholent is made from Portobello mushrooms, sunchokes (Jerusalem artichokes) and barley. The menu also includes items like matzo ball soup, knishes and coleslaw. However, Brooklyn Sandwich focuses on making sure the menu is healthy, swapping French fries for crispy potato wedges and mashed potatoes for cauliflower masha and adding chipotle aioli on your knish. Perhaps most important to the students, is that they can have a trendy, tasty and satisfying meal — replete with main dish, side and drink — for a reasonable $15. Hours of operation are Sunday – Friday 11am – 2:30 PM. The truck is kosher-certified by Rabbi Hillel Baron of Congregation Ahavas Israel in Columbia, Maryland, the other rabbi in the operation. The brown and gold colored truck will be parked two to three days a week on GW’s campus and at the hot-spot food truck areas around DC the rest of the time. Brooklyn Sandwich Co. will also be at places in the Silver Spring area periodically, as appropriate. They also do catering in the MD/DC/VA areas. Brooklyn Sandwich Company is going to be a student-run not-for-profit concern, with students doing the marketing, accounting and other administrative and managerial tasks. At this point, the only paid employees are non-student culinary staff who prepare and prep the food at a kosher commercial kitchen so that dishes can be made to order and served from the truck. Yet the students will be paid to work in the trucks, helping to prepare the food and working as cashiers. Now, when customers approach the brown and gold truck, Steiner jovially takes their orders while Yassel Backman, whose father runs the University of Maryland Chabad, assists. When asked on a hot Monday afternoon if his is a full-time position, Backman, brow furrowed, immediately looks to Steiner, who says, “I think I hired you full-time.” The pair busily fills orders together, but Steiner’s droll, easygoing personality keeps customers smiling. “In general, I think that students having kosher food and enjoying it and having it be appealing to them and having it appear often at school is super important,” Ms. Meisel said. To find the daily location of the Brooklyn Sandwich Co. truck, you can follow them on Twitter @bklynsandwichco or go to https://www.facebook.com/brooklynsandwichco/. 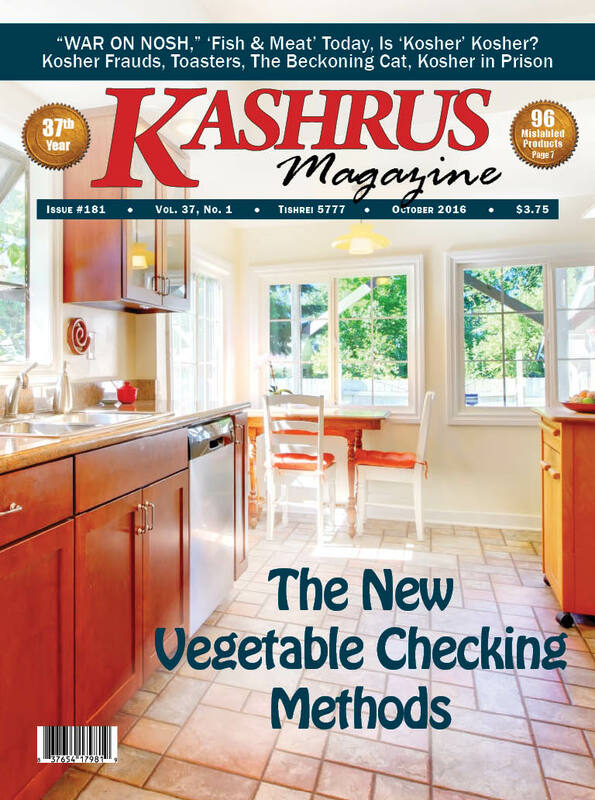 Unknown to the public, kashrus is undergoing serious changes in the arena of vegetable inspection. We are still in the changeover stage. It is hard to say how long that will take, but, at the end, hopefully, all sincere kashrus agencies will be ‘in sync’ regarding insect free vegetables. Until then, the kosher consumer needs to satisfy himself that a given kashrus agency is meeting his needs. For many years now pre-washed “bug-free vegetables” are being sold. Not all of them, however, have been up to par. Less than two months later that company had to stop production because consumers were finding too many insects in their products. In the last six years, the insect infestation level of leafy vegetables in the field has increased. At one time, after a good wash, companies always found their pre-packaged iceberg lettuce to be acceptably clean (though not always so with romaine). That false notion was shattered about 6 years ago when the major kashrus organizations could not put iceberg lettuce out for sale for several weeks due to the level of infestation. Each spring and summer increased diligence is required as the insect population soars during those months. Just this year, nearly all kashrus agencies (in the U.S. and in several foreign countries) announced to the public that the situation with leafy vegetables had hit new levels and that methods for cleaning needed to be increased in scope and intensity. For a period of weeks (months in some cases), some kashrus agencies removed their certification of certain vegetables. Their symbol did not appear on the packaging. This summer, in Flatbush, two kashrus agencies printed a series of full page advertisements warning the community of increased infestation and explaining their (new) procedures. One agency even notified Flatbush consumers that they would not find all the vegetables normally on the menu in their restaurants. How are the Kashrus Agencies Dealing with the Problem? Obviously, we have progressed and today many companies in the U.S., Israel, etc. claim to be “bug-free.” The systems for growing in greenhouses [not all brands use greenhouses], washing, and sample checking have improved significantly. Today, many feel safe with certain companies from among the many making the “bug-free” claim. But, in the commercial setting of a restaurant or a catering commissary, it is not universally practical to use specially grown, pre-washed vegetables with a hechsher, so many kashrus agencies expect their mashgichim to prepare off-the-shelf vegetables that are “bug-free” when they may well have been riddled with insects from the start. There are many scenarios where a mashgich’s checking will not always be successful in preparing the vegetables. There are pressures placed upon him in terms of volume and timing. There is the area where the checking is to be done, which may not always be adequate. There is always the possibility of human error. Finally, there are substitute mashgichim who are not yet adept at checking. Well-run kashrus agencies assign special staff to check on the performance of their mashgichim in restaurant and at caterers. They will come, examine salad greens which were already checked by the mashgiach to see if he overlooked any insects. Recently, in New York City, some specially-trained young men fanned out and checked the produce of many restaurants. Unfortunately, they found inadequacies [read that “insects”] in far too many establishments. Fortunately, they informed the agencies and a serious overhaul has begun. There is retraining going on, increased checking on the mashgichim’s performance, and generally tightening up of systems by those who want to achieve the goal of presenting really bug-free produce to their customers. A video was taken of one Caesar salad (without dressing) that was bought at a kosher-certified restaurant. Eleven insects were found in that one salad. To be fair, that was several times the worst finding that they had discovered elsewhere. These insects were visible with the naked eye, not requiring a jeweler’s loupe to see them. And this from a restaurant with a kosher certification on the store and a mashgiach on the premises. There basically are two main questions facing the kashrus agencies. Until recently, the best method for getting clean vegetables was to check each leaf on a lightbox. Next best was a triple wash using soap to make the insects release their hold on the leaf. In addition, water pressure was applied with the faucet or a spray. Today, a new method is taking hold called the thrip mesh or the “shmatte bedika” where you soak the vegetables and then examine the water by pouring it into a fine mesh to trap even the tiniest bugs. Next you examine the cloth. Many have embraced this shmatte bedika as the new stand-alone model as it is very successful. Others are using the older methods, perhaps with a few tweaks. Some mashgichim are using a longer procedure employing shmatte bedika combined with checking on a light-box. There are others who do several checks with the shmatte bedika. The method of choice is up to the Rav Hamachshir for the kashrus agency that is certifying the establishment. A significant step is being employed by many kashrus agencies, especially the stronger ones. It is called a “pre-check.” They check the heads before washing the produce. If they find a significant number of insects before the washing [usually 3 in each head], they will reject the entire batch. As kashrus agencies compare results with other agencies and tweak their systems to get the very best methods, our protection increases. The other area of concern is the numbers. How many bugs in how many leaves is significant. This is a complex issue relevant to the rabbonim but not to us directly as we will not be privy to the numbers. There are those who may dismiss much of what I have written because they have chosen to follow a series of myths. Myth 1. The only way to see these insects is with a jeweler’s loupe. False. It is true that there are very tiny insects that can only be seen by a trained mashgiach or with a loupe, but the fact is that if there are very tiny insects [e.g. baby thrips], there will usually be larger ones there too [adult thrips]. When an insect has been isolated from the background camouflage, it is visible with the naked eye. Myth 2. All kashrus agencies and all mashgichim are the same. False. Some mashgichim have received intense one-on-one training with a bug expert and others use the “learn-on-the-job by yourself” method. I know substitute mashgichim that never met their Rav Hamachshir and were not trained by him. Myth 3. Nobody can get vegetables truly “bug-free”. False. The people in the kashrus field know who has such a reputation and who does not. Myth 4. Triple washed pre-packaged vegetables are just as good as the best mashgichim checking off-the-shelf vegetables. False. Triple-washed may be completely inadequate. Often the water (with the insects in it) is recycled for all three washes. Also, everything hinges on the state of the vegetables that go into the wash. If the vegetables are heavily infested, the wash won’t guarantee freedom from insects; but, if you examine leaf by leaf, you can be more certain. If any kashrus organization requires assistance in arranging for retraining or for learning about the shmatte bedika method, contact KASHRUS Magazine at kashrus@aol.com. We will direct you to those who can help.